I’ve had the pleasure (and sometimes pain) of doing and seeing a wide variety of corporate entertainment events for a number of different organizations. Many of them have gone phenomenally well, others weren’t quite as lucky. As someone who (presumably) knows the audience, you can help the entertainer get crystal clear on what’s appropriate, what’s inappropriate and what will result in getting the mic turned off. Some comedians are more risquÃ© than others, knowing the audience, and sharing it with the entertainer can help make sure everyone goes home happy. Expectations to be clear on: start time and end time (and amount of flexibility), content rating (G, PG, PG-13, R), size of audience, AV equipment, room layout, attractiveness of audience (OK, maybe not this last one). Even if you want to go “all out” for your group, rarely does more than 60-minutes of comedy go well (particularly if it’s been an all-day event). Keep it short and keep it fun. The audience should be left wanting more, not wanting the show to end. If you do have more than 60-minutes scheduled, consider a keynote or workshop that is fun and educational. 3. Don’t Schedule Comedy During Dinner. While it might seem like an efficient way to schedule the agenda, eating + comedy don’t go well together. Either no one laughs because they have food in their mouth, or no has food in their mouth because they’re laughing. The best time-slot for comedy is before dinner or right after the desserts have gone out (just make sure to tell catering not to clear plates during the show). 4. Don’t Forget About Bio Breaks. Before the comedy happens, make sure to allow time for a bio break and announce it! Nothing interrupts a comedy show more than a mass exodus to the restrooms, or worse, someone who laughs so much they… well let’s not get into that. 5. Tailor the Comedy to Your Audience. Finally, as an event planner it’s important to consider your audience when selecting a comedian or group. The entertainment should be appropriate for the size of the audience, setup of the venue and the energy of the event. After all, you wouldn’t book U2 for a show in a conference room. 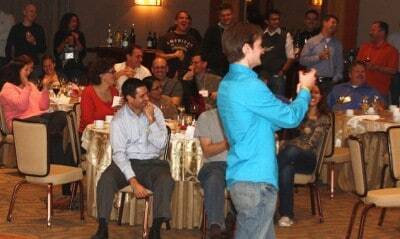 A good corporate entertainer will help you understand all of the nuances to consider. Have any questions or concerns? Feel free to send us an email at entertainment@humorthatworks.com. It’s usually fun when a company decides to put on an event for their employees and they have all the essential things needed to make it an entertaining experience for everyone. I agree with the point made about not scheduling comedy during dinner at the company event. Not a lot of people will pay attention to the comedian or their food will get cold because they were watching the comedian; either way, entertainment should happen before or after dinner so that guests can give their undivided attention. Thanks for pointing out that you should be clear about your expectation with your entertainment. More specifically you said that since you know your audience the best, you will be able to tell the entertainment what is appropriate. I think it’s a good idea to choose hire corporate entertainment throughout the year. Great article. We find the biggest mistake people make when hiring for corporate entertainment is having entertainment for the sake of entertainment. Superb article, a must read for anyone who is looking to make their corporate event a success.